Lord, if you don’t return first, make me usable to build your Kingdom! Right after I got saved I had such a burning desire to be used mightily of God. I began to pray: “God use me, God use me.” Then the Holy Spirit revealed to me that it is not a matter of God wanting to use me. He is ready to use me. It is a matter of me allowing God to make me usable. If you will allow God to make you usable God will use you right now. It is what He has done throughout history. You are not required to do anything else for God to start using you now. You don’t have to read another book, attend another seminar, listen to another cd, memorize another scripture, plant another seed gift or repeat another creed or confession. You don’t even need to attend another church service before God will begin to make use of you. Matthew was a tax collector who became a disciple. Gideon was an ordinary manual worker who became a fearless leader of men. Jacob was a liar whose name became Israel. Deborah was a housewife who became a judge. Rahab was a high class prostitute who was grafted into the blood line of Jesus. Moses was a stutterer who became a deliverer. Jeremiah was a child who fearlessly spoke the Word of the Lord. Aaron was a servant who became a spokesman for God. Nicodemus was a Pharisee who became a defender of the faith. David was a shepherd boy who killed a giant and became a King. Hosea, a marital failure who prophesied to save Israel. Joseph was a prisoner who became prime minister. Esther was an orphan who became a queen. Elijah was a plain man who became a mighty prophet. Joshua was an associate who became a conqueror. James and John were fisherman who became close disciples of Christ and were known as the “Sons of Thunder”. Abraham was a nomad who became the father of many nations. Peter was a businessman who became one of the greatest evangelists to walk the earth. Jacob was a refugee who became the father of the twelve tribes of Israel. John the Baptist was a vagabond who became the forerunner of Jesus. Nehemiah was a cup bearer who built the wall of Jerusalem. Shadrack, Meshech and Abednego were Hebrew exiles who became great leaders of the nation of Babylon. Hezekiah was an idolatrous father’s son who became a king renowned for doing right in the sight of the Lord. Isaiah was a man of unclean lips who prophesied the birth of God’s Messiah. Paul was a tormenter of Christians who became the greatest missionary in history and wrote two thirds of the New Testament. God is no respecter of persons. What about you? Stop praying, “God use me.” Start praying, “God, make me usable.” All God needs is all of you. Remember, the Bible says, “I can do all things through Christ who strengthens me.” Let these words sink deep into your spirit. Let God strengthen and encourage you to be all that you can be and all that God intends for you to be. What an awesome presence of the Holy Spirit there was in our special Resurrection Sunday Soul Winning and Healing service at The Rock of Cape in Cape Girardeau, MO where Dr. Mark Carbaugh is pastor. The altars were jam packed with a mass of people getting saved and healed! This precious couple had divorced and seemingly had no chance of reconciliation. BUT GOD!!! She had not been back to the church since the break up and refused to come back. Not only did she come to the revival service, God saved her, filled her with the Holy Ghost and restored their marriage!!! Their precious child, Ava Leigh, will now be raised in a godly home by both her parents…TOGETHER!!! THAT’S THE GOD WE SERVE!!! This mighty man of God was filled with the Holy Ghost and called into the ministry in a camp meeting I preached at Whitefield Assembly of God in Ripley, TN three years ago. He is now pastoring a thriving church in Covington, TN! On Friday before Resurrection Sunday this young man, Marcus, brought me back to the service department to pick up my car following an oil change. I was able to share the love of Jesus with him and lead him to the Lord. On Resurrection Sunday he brought his family to church and is now faithfully serving the Lord! The power of God is flowing so mightily in each of our revivals. 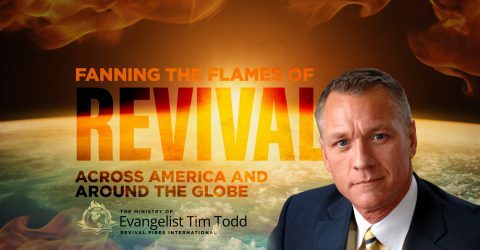 This year we are witnessing more people getting saved, filled with the Holy Ghost, healed, delivered and set on fire for God than in the previous 30 years of being on the evangelistic field!!! Recently preached the Spring Camp Meeting at Whitefield Assembly of God in Ripley, TN for my dear friend of more than 30 years, Pastor Jeff Ogg. We had a tremendous move of the Holy Ghost in each service. Many received Christ as their personal savior, many were filled with the Spirit and many were healed in each service. Angie and I had our very first date in Pastor Jeff’s car 25 years ago this past February. We continue to give thousands of Truth for Youth Bibles to young people across America. As a result many teenagers are giving their hearts to the Lord!